Here is a fabulous breakfast option for you! While I don’t mind a boring egg burrito, I certainly won’t turn down one that isn’t boring! If you don’t know by now, I really L.O.V.E. sun-dried tomato. It’s packed with so much flavor and I love how it adds a little sweetness to whatever it gets put with. This little egg wrap is amped up with flavor thanks to those tasty sun-dried tomatoes and the spinach and feta cheese really round it out. I love the nutritional benefits of all components. Plus, it really only took me five minutes to make. This is becoming a “regular” around here. I wrote the recipe for one wrap, but this can EASILY be doubled or tripled or quadrupled (you get the idea). Heat a small skillet over medium heat. Spray with non-fat cooking spray (I use canola). Add chopped spinach and sun-dried tomatoes to skillet and sauté until spinach is slightly wilted. Remove from skillet and place on wrap. Meanwhile whisk milk, egg and additional egg white together in a small bowl. Once spinach and sun-dried tomatoes have been removed from the skillet, add eggs. Cook and stir until eggs are completely set. 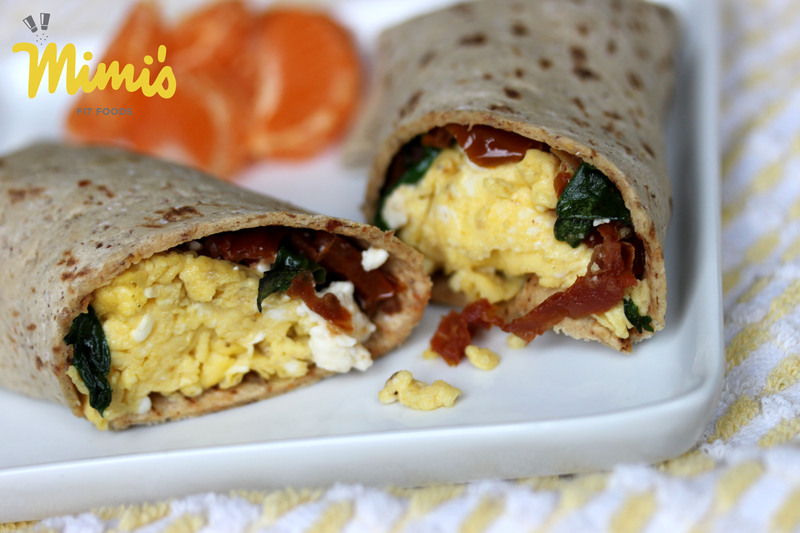 Place scrambled eggs on wrap (over your spinach and sun-dried tomatoes), top with feta cheese. Fold bottom and sides of wrap over filling and roll. Serve immediately.